Across the street from where Jen used to live there was a restaurant called Two Boots. The idea was to combine the foods of Louisiana and the foods of Italy, two geographical bodies that both vaguely resemble boots. One resembles the type of boot one might expect a bordello worker to wear. The other resembles a construction worker's. I'm not saying which is which. Now, apparently, there are several locations for this Brooklyn restaurant in the United States. The thing that I really liked about this restaurant was that it combined Louisiana and Italian cuisine but it was not fusion. Instead they simply offered pizza and pasta as well as a selection of fried catfish and po' boys. I respect them for that. Tonight, I unintentionally did what I'm glad Two Boots did not do and made a kind of Louisiana/Italian fusion cuisine. I caramelized some spring onions in olive oil and butter, chopped up some tasso from the freezer, then finally added some peas and pesto. 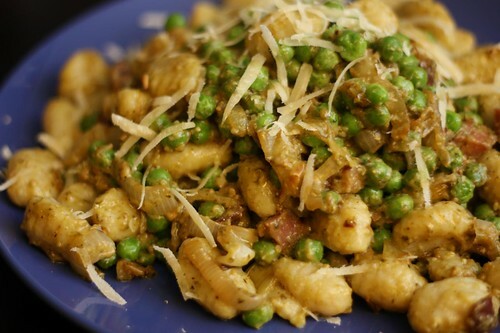 Then I tossed in some gnocchi with a little bit of the pasta water and served it up with some grated Parmigiano-Reggiano. The result was excellent. This was maybe one of the top ten best pasta dishes I've ever hastily thrown together. We were in Montreal, briefly, for the weekend. 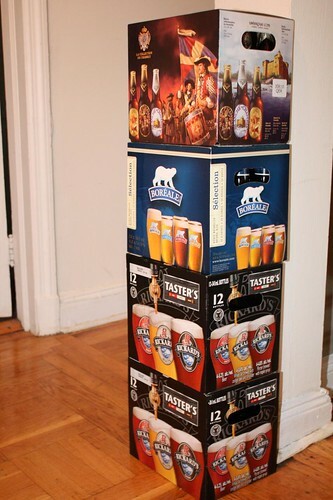 On our way out of town we stopped off and picked up a dozen Montreal bagels and all of this beer. I asked the woman at the border what the maximum amount of beer you could bring across the border legally was. I had no intention of actually purchasing the maximum until I saw how truly cheap these beers were. That left me little choice but to purchase 4 12-packs of Canadian beer. After all, these aren't available in the United States (at least the part I live in) so why not go for broke? Besides, the exchange rate was at a perfect 1:1 and how often do you get a chance to take advantage of that? Even though that's not actually an advantage at all. 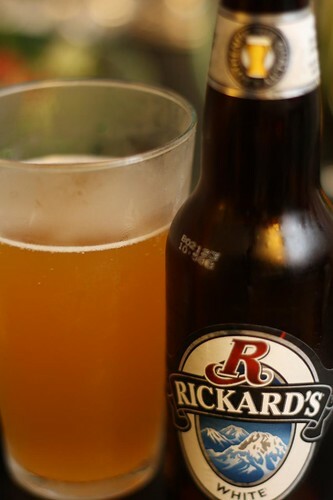 The first beer we tried was the white ale from Rickard's. I'm not sure if white ale from Canada is considered a perfect accompaniment for Cajun-Italian food but this worked out well at any rate. Of course, I don't really believe in the pairing of drink and food so I'm the wrong person to ask. Stay tuned over the coming weeks (or months) while I find ways to inexpertly pair the remaining nine Canadian beers with food! Seeing all that beer sure makes your dad proud. His father in law as well. I also want to say that the cases in the photo look like 24's not 12 packs. Lastly, this is the fiorst time I have ever heard/read that someone considered canadian beer inexpensive. They are 12 packs. Must be the amazing photography that multiplies them. $13 for a $12 pack is pretty inexpensive by Northeast standards. Most beers (at least the ones worth drinking) are about $9 or $10 for a 6 pack. Gansetts are now $10 for a 6 pack?